Cervicogenic headaches are headaches that originate from the neck. Prolonged sitting and excessive computer use are common causes of cervicogenic headaches, which is why many office workers suffer from cervicogenic headaches. Headache around the forehead and temples. Cervicogenic headaches originate from the neck. As such, it is common for there to be neck pain as well as one of the headache pains mentioned above. Because cervicogenic headaches originate from the neck, the neck should be the focus for preventing and treating such headaches. This is of particular importance for office workers or anyone who does a lot of computer work, due to the postures that the neck is often placed in for long periods of time. Any posture that irritates the cervical spine or sends the neck muscles into spasm can lead to cervicogenic headache. The most common and the most provocative posture that you should try to avoid to prevent cervicogenic headaches from occurring, is a poking chin posture, or a forward head posture. The poking chin posture or forward head posture, compresses the upper cervical vertebrae. This invariably leads to irritation of the cervical joints, which can lead to pain and subsequent referral to the head as a cervicogenic headache. Additionally, a poking chin posture or forward head posture results in the constant stretching of the muscles that run from the top of your shoulder blades to your neck. Because this isn't the body's normal position, this usual leads to pain being felt around these muscles. This in itself can present as a cervicogenic headache, because these muscles can refer pain to the head. Moreover, as a defence mechanism to protect against this pain, your body will often send the painful muscles into spasm. This then has a continual downward spiral effect because the muscle spasm results in increased pulling forces where these muscles attach to the cervical spine, which causes more pain, which in turn cause more spasm. So the cycle repeats! There are a few warning signs that should alert you to the fact that you may be developing a cervicogenic headache, or that your current headache is referring from your neck. Headaches only associated with computer or desk work. 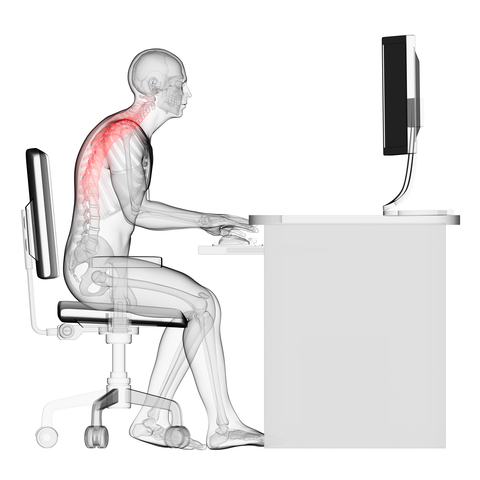 Since bad posture is the leading cause of cervicogenic headaches in office workers, optimising office ergonomics, or ensuring your workstation is ergonomically set up, provides the best protection against cervicogenic headache. As such, an ergonomic assessment is indicated for those suffering from cervicogenic headaches. The importance of ergonomics in preventing headaches can be thought of this way: If you're receiving 30-60 minutes of treatment every week for neck pain, but then spending 40+ hours per week reversing the effects of that treatment by sitting at a workstation that is not ergonomically friendly, the treatment you are receiving is likely to be ineffective. Have your backrest leaning back just a little bit, but then make sure you're pushed in. It's always difficult to treat and assess yourself. This also applies when you're trying to perform and ergonomic assessment on yourself. As such, the safest and most effective way to address the ergonomic issues that may be contributing to your symptoms is to get a professional ergonomic assessment.